Since the beginning of the Afghan campaign, the Taliban caused problems to most coalition forces by approaching “Forward Operating Bases” (FOBS) and laying IED’s, throwing bombs or firing rocket propelled grenades into them. Traditional CCTV surveillance proved incapable of keeping insurgents from creeping right up to the FOB walls. Traditional large blimp surveillance aerostats were too big to inflate and deploy at these small bases. 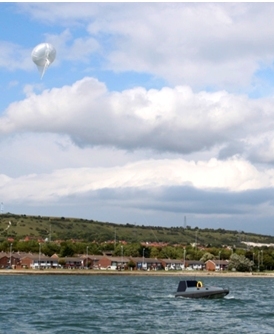 Eventually, it was realised by coalition forces that smaller aerostats would be the best answer. 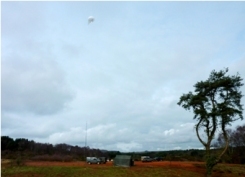 So, purchased and extensively tested by the US Army’s “Rapid Equipping Force”, via Carolina Unmanned Vehicles Inc and Georgia Tech University, the “Small Tactical Multi-Purpose Aerostat System (STMPAS)” has been successfully operating in numerous small FOB’s. Consisting of a 75m3 Desert Star Helikite, carrying Cloud Cap Tase 400 gyro-stabilised video camera gimbals up to 1,500 feet, the system can detect and target the positions of insurgents from long distances for many days duration in all weathers. The Helikites have proved a great success. FOB’s with Helikites flying over them keep the Taliban over a mile away, where they are not a threat. This saves lives and injuries, keeps land safe from IED’s, as well as greatly reducing Taliban effectiveness – for minimal cost. Helikites are the only small, easily handled, aerostat capable of operating at sea in all-weathers. 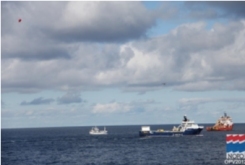 In collaboration with Maritime Robotics in Norway, Allsopp Helikites Ltd have been developing a maritime airborne Helikite camera system suitable for aiding oil spill detection and clean up. The system called, “Ocean-Eye” is now in operation with Maritime Robotics AS and the Norwegian Clean Seas Association for Operating Companies (NOFO). Oil spills are very hard to spot from sea level. Airborne cameras are a great help in determining the extent and thickness of the oil over the sea. 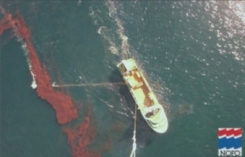 Aircraft and UAV’s have proven too short-term to partner with the clean up vessels during oil sweeping operations. However, small Helikites flown from the clean up ship or nearby small boats are able to provide real-time streaming aerial video of the oil slick as the clean-up boom is positioned to pick it up. This allows very accurate positioning of the boom and allows more oil to be extracted from the sea in a shorter time. 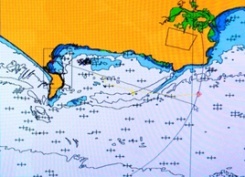 Thus reducing onshore pollution, damage to the marine ecology and clean-up costs. Australian Defence Force (ADF) / US Army. Australia. Australia is very large. So long distance digital radio-relay is essential to allow modern net-work radios to work properly for its military or emergency services. 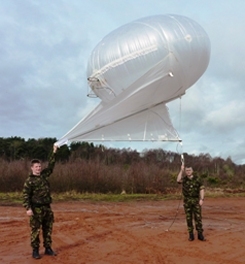 The ADF first tried to use TCOM 17metre long, 800m3 volume aerostats to lift the Ratheon “Micro-Light” radios to 1000ft. But these required numerous truckloads of helium, driven hundreds of miles into the bush and they were so large, heavy and difficult to operate in any weather, that they gave them up after a couple of days attempted operation. To replace them, they bought instead some 4 metre long, 15m3 volume Desert Star Helikites that can be inflated and easily deployed to 1000ft within minutes from just five Pelicases - including helium. These proved a great success, lifting “Microlight” with no problems, keeping the antenna stable automatically and getting 42 miles line of sight range with high bandwidth. “Microlight” also is unique in providing robust and very accurate positioning of users – totally independent of vulnerable GPS. A useful feature that is likely to prove very valuable in any future conflict. This successful program is ongoing. BABLOS is the only proven, rapid, tactical range extension system for the Bowman radio. Designed for the 2011 Excercise Cougar in Oman, BABLOS ended up with the Royal Marines on HMS Ocean during the Libyan campaign. It enables troops on the shore to communicate with ships over the horizon using a standard, unmodified, Bowman Radio. This allows ships to remain out of radar range of anti-ship missiles. On its own, the Bowman Radio has very limited performance. It is essentially line of sight, and without elevation of the antenna, a typical maximum range and area of coverage of about one mile is often observed. BABLOS brings Bowman to life. Within 10 minutes inflation and deployment time, the small, stealthy, 10m3, all-weather, Desert Star BABLOS Helikite lifts a specially designed wideband antenna and lightweight coax cable to 200ft. During pre-deployment trials with the Marines in the UK, the expected range of 17 miles was achieved giving 908 square miles coverage. The entire BABLOS system including helium cylinders, Helikite, launch system, flying line, coax cable and antenna can fit into 4 x 130 litre Bergan backpacks. This ease of mobility proved important, because during its deployment to Oman, the BABLOS system was required to be transferred, by simple manhandling, from ship to shore four times. Unmanned Surface Vessels (USV’s) are robot boats. The Royal Navy is testing them for hunting and destroying mines away from the manned naval vessels. They are proving promising for this job. However, they need to be within radio-range of the manned ship for their control and also to send the information they are collecting back to the ship. This means one or more large, expensive, fully manned naval vessels will be loitering for many hours or days within easy visual line-of-sight range of multiple enemy shore batteries and anti-ship missiles. This is obviously not a good idea. Small 15m3 Desert Star Helikites lifted Cobham Network radios + antennas to 900ft altitude providing over-the-horizon radio communications between the shore and the unmanned boat. This worked exceedingly well, allowing the USV to go more than 20 nautical miles over the horizon whilst relaying full streaming video, positioning data, engine data etc. This allows ships to remain out of easy detection by enemy shore forces and so increases the safety of ships and crews. Greater range is possible with greater altitude. Many areas, such as the Arabian Gulf, can be cleared of mines by using USV’s deployed from shore, operated via Helikites flying from shore or the sea. This trial proved beyond any doubt that Helikites can be easily and safely flown from USV’s. A remote controlled electric winch on the USV launched the Helikite hundreds of feet into the ky where it flew steadily in high winds. During this trial, every type of USV manoeuvre was tried to cause the Helikite to become unstable or get the flying line caught in the propeller, but it proved impossible to upset either the Helikite or the boat. It is proved easy to fly Helikites from USV’s with little loss of boat speed. Helikites have a similar endurance to USV’s, which means that now they can pull Helikites carrying broadband radio transceivers far out to sea for weeks. These MANET radios can spread broadband comms over thousands of square miles of ocean – allowing the spread of robotics throughout the oceans. 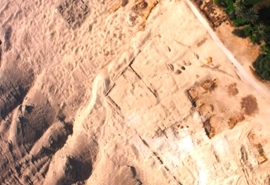 Aerial Photographic Survey of Ancient Armarna, Egypt. University of Cambridge, Archaeology Department. 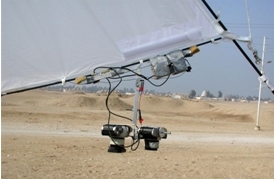 Helikites are often used for archaeology photography using digital cameras. Cambridge University however, wanted to take stereo still images with a pair of 35mm SLR’s. The site was ancient Armarna in Egypt, where Tutankhamen was born. The 7m3 Skyhook Helikite was fitted out with a payload attachment system to hold the cameras steady on the Helikite keel. It worked very well, giving ultra sharp, stereo images of the entire area under investigation. Helikites allow far greater timeliness than aircraft, are far cheaper and give better resolution too due to their relative closeness and low vibration compared to aircraft. The Helikite was featured in a BBC “Timewatch” program of the operation. The Helikite performed perfectly in the very hot conditions in Egypt and is now housed their permanently. Tethersondes are used to measure wind speed, humidity, temperature etc at height. 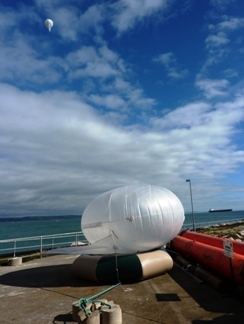 They are attached to the tether of aerostats which are then sent up to high altitude. The advantages are that readings can be made at a variety of heights simultaneously. This is essential for the understanding of the boundary layer of air situated just above the land. This behaviour of the boundary layer can influence the weather and also dictates the position of much air pollution. 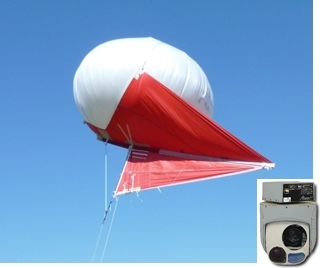 Recently, the University of Millersville replaced their old damaged traditional blimp aerostat with a new 11m3 Skyhook Helikite to lift their Vaisala tethersondes. It has been performing very well. So far it has operated in winds up to 16m/sec (32knots) with no problems. As it is capable of flying steadily in winds up to 45 knots the Helikite should prove useful for much future work. Helikites as small as 2m3 can also carry tethersondes, but not so many at one time. Use Lightweight Helikites and a 1 cu metre Skyhook Helikites to lift a 140ft Short Wave Aerials. Very clear reception/propagation from England to contacts as far as Chile - using just 3 watts of power. 4 x Stacked Special Wide-Winged Lightweight Helikites (total helium volume of just 0.5 cu metres) were stacked one above the other and used to lift an antenna weighing 1 Kg, to 5000ft directly over Portsmouth. The performance of these tiny Helikites was exceptional by any standards. The Helikites were required because they produce no radio noise and so the antenna was able to discern much subtler differences in radio waves than was possible using aircraft. Deployed from a very small boat in the Solent using an electric winch. After use the four small Helikites were stored fully inflated in a cupboard. 1 x 3 cu metre Skyhook Helikite used to lift Mini RG59 coaxial cable plus standard military whip antenna to increase UHF/VHF radio range from 2 miles to 25 miles. Despite very weak signal strength from the aerial at the top of 300ft of coax, the signal was very clear and so could be easily amplified for reliable comms. 1 x 7 cu metres to study the feasibility of lifting pseudolites to counter jamming of the satellite GPS network. Concluded that it was feasible and reasonable. 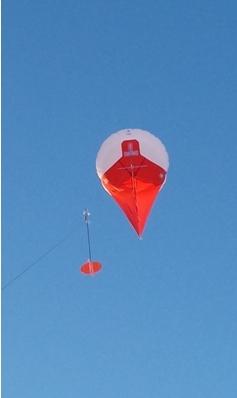 1 x 7 cu metre Skyhook Helikite lifted a 2 Kg package containing UHF radio relay unit to 1500ft above New Mexico. Successfully relayed video images and control data to and from an un-manned ground vehicle test unit 61 miles away. This corresponded exactly to the theoretical radio line of site. Maj. David Worden, Royal Signals, UK, 2004. Cranfield University M.Sc. Project. He used a 3 cu metre Skyhook Helikite to lift RG174 coax cable to 200ft to test the reception in the surrounding area. Then he compared the results to the theoretical computer model at Blandford. The results were very good, both in the fact that greater distance was possible using the Helikite than the standard military radio and also because the actual readings corresponded to the model very accurately. So it was reasonable to use the model to extrapolate what would happen if a battery powered re-broadcasting unit was lifted to greater height on a Helikite. The model predicted high quality VHF/UHF comms over great distances with radio relay units lifted above 1000ft, and the paper concluded that Helikite lifted antennas should be considered for certain military communications duties. 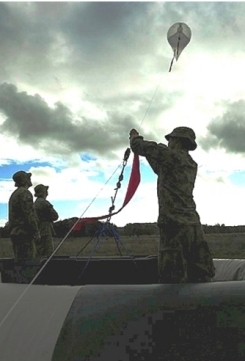 Use a 16 cu metre Skyhook Helikite to lift re-broadcasting equipment over the mountainous country. Good results obtained both regarding the performance of the Helikite in difficult catabatic winds and we believe for the radio reception. Mobile Rapid-Reaction Emergency Comms Station - 1 x 34 cu metre Skyhook Helikite deployed from a specially made Helibase situated on the roof of a trailer pulled by a SUV. 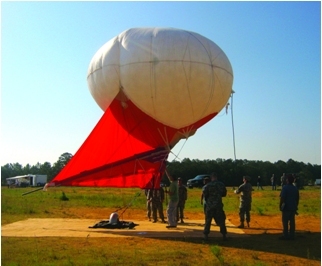 Ability to set up and inflate the Helikite along with its payload within 20 minutes. Operated a 34 cu metre Skyhook Helikite from a specially made rapid-reaction trailer to provide radio-relay to the forest workers who were out of any cell-phone range. Lifted the new ITT Spearnet MANET radio on a 3.3 cu metre Skyhook Helikite to create the UK’s first airborne Mobile Ad-Hoc Radio Network. Perfect reception wherever there was direct line-of-sight. Aquired a 34 cu metre Skyhook Helikite for unspecified duties. It was later reported flying over the winter Olympics in Vancouver acting as a possible sensor or radio-relay. Personal Role Radio Relay trials. Salisbury Plain. One 7 cu metre Skyhook Helikite lifted a 100Mw/2.4GHz PRR relay to 1000ft. Proved to give exceptionally good radio comms anywhere within line-of-sight. Used a 5 cu metre Desert Star Helikite to lift a Rajant ME2 MANET radio to 500ft. This 400Mw/2.4GHz MANET radio sent good quality 5 frames/second video 6 miles using simple dipole antenna. A 20m3 Desert Star Helikite system similar to the system delivered to the ADF for the Talisman/Sabre Excercise was delivered to the French Paratroopers. This is used to lift a RF-Over-Fibre Optic system to 1000ft in order to extend the range of the French “SINGARS” radio system. Ongoing. 5 x 3 cu metre Skyhook Helikites to lift radiosondes up to 3000ft to measure weather characteristics. 6 x 11 cu metre Skyhook Helikites, modified to be stacked one above the other to lift a 30 Kg photographic payload above the sea from a barge in the Irish Sea. Later two were stacked to drop test an Experimental Unmanned Air Vehicle. This UAV testing took just one afternoon, compared to the 5 days that it was estimated that it would have taken using Qinetics normal blimp. 1 x 21 cu metre Skyhook Helikite and 1 x 16 cubic metre Skyhook Helikite to lift 13 Kg and 8 Kg respectively, photographic payloads to 200ft from the beach to assess sea-surface characteristics. 1 x 7 cu metre Low Visibility Skyhook Helikite to lift digital cameras to 1500ft to monitor traffic. - 1 x 11 cu metre Skyhook Helikite and 1 x 5 cu metre Skyhook Helikite to lift their gyro-stabilised pan/tilt/zoom video camera plus radio downlink. 3 x 1.6 cu metres, to lift air monitoring equipment to facilitate the helicopter laser surveying of pylons. Also, to lift digital cameras and long tubes to sample methane in the atmosphere. 5 x 3 cu metres to scare large flocks of geese and seagulls that were heavily contaminating the reservoirs around Glasgow with faeces to the extent that the reservoirs were to be closed. This operation necessitated the creation of extra strong and stable Skyhook Helikites capable of flying constantly in almost all weathers. 1 x 2.6 cu metre Skyhook Helikite to lift a video camera to 300ft deployed from a tiny rubber dingy in a Mexican estuary, to film a short movie that came second in the Prix De Rome art competition to win 10,000 Euros prize money. 1 x 3.3 cu metre Skyhook Helikite to lift cameras for remote sensing. Two week trial lifting pan/tilt/zoom radio-relayed video cameras above Salisbury Plain during the URBEX urban warfare exercise. The Helikite Cam gave excellent real-time video coverage of the exercise with complete reliability despite snow, high winds, sleet and cold. Production of a 35 cu metre Skyhook Helikite required to lift 8Kg of radio-relay equipment and 3 Kg gyro-stabilised video camera to 1000ft within 20 minutes. The Helikite is launched from a Heli-Base situated on the roof of a trailer containing the winch, generators, helium and ground control station. This was tested in Dec 2005 and the system worked well. Production of a 60 cubic metre Skyhook Helikite with a payload of 30 Kg (8Kg payload plus 22Kg of flying line) and ground handling facilities transported on a trailer. The Helikite has a requirement to be deployed to 5000ft from a greenfield site within two hours. The purpose is to lift radio-relay equipment to track and transmit data from sea-skimming missiles at Eglin AF Base in Florida. The Helikite and trailer are made and successfully flight tested in January 2006. Revivor aerostat replacement program. Using 34 cu metre Desert Star Helikites and specialist winches to lift E/O – I/R cameras plus radio links up to 3000ft in Afghanistan. Entire system supplied and tested by Allsopp Helikites. Numerous 75m3 Desert Star Helikite for lifting gyro-stabilised surveillance cameras to protect troops from insurgents. The Helikites are small enough to be operated in Forward Operating Bases that are too small to deploy large aerostats of traditional design. Without the Helikites insurgents were able to get within a few yards of the FOBS. The cameras on the Helikites keep the insurgents over a mile away from the FOBS, thus saving injuries and lives. 1 x 65m3 and 2 x 100m3 Desert Star Helikites for flying up to 5000ft from a small vessel to lift fibre-optic cable plus antennas etc. Used the “Large Helikite Winch”. Very successful. The Helikites flew very well from the ship. Ground-handling was easy and launch was very rapid. The system was also used on mountains at a later time where it proved equally capable.